I wrote a guest blog on a great website – www.naturalintution.comabout what is really important during this holiday season. Go take a look and let me know what you think! I can’t believe I haven’t posted information on bone broth before now. Ok, it is a gazillion degrees outside and it might seem like an odd time to talk about broth, but it’s really not. Bone broth is one of the best ways to get nutrients into our bodies, and we should all be looking for ways to get more nutrients in! 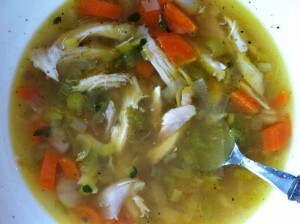 It can be enjoyed as is, or as the base of all kinds of soups, stews, etc. In the picture above, I just threw in some celery, carrots, and leeks (they were in the crisper and needed to get used, but an onion works just as well), then added some rotisserie chicken and fresh herbs. It is yummy, and even on hot days like we’ve had lately, it’s light and soothing. Besides that, it makes the house smell great when it’s cooking! Click here for a great article on how to make it and its benefits. Do you like great spice blends like I do? I found a new company that has some really nice ones – Charleston Spice Company. Here is their info: www.charlestonspice.com. Posted in Cook Something Great, Food, Quickies, Recipe websites | Comments Off on Spices! I’ve ordered a fabulous spice blend from Zuma Organics and, as a bonus, found out that they have a great website with yummy recipes! I can tell you from experience that the Bag O’Chicken Lemon Love is a really easy, delicious dinner. Click here for Five Easy Back to School Dinners. Put It In A Pumpkin! At a recent Healthy Priorities get-together, we all brought food that we could serve in a pumpkin. I know – how cute is that idea?! I can say that because it wasn’t my idea at all, but thought it would be fun. 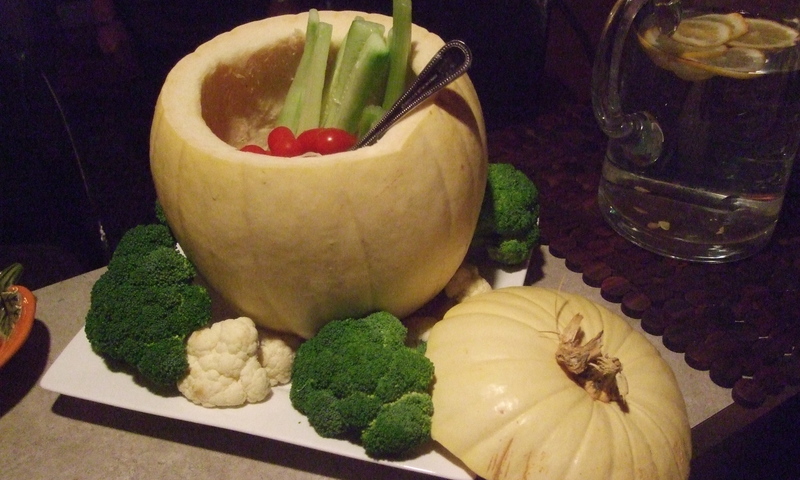 Sure enough, everything is way more fun to eat when it’s served in a surprising way, and pumpkins fit the bill. The nice thing is that now we can find all kinds of different orange pumpkins, white pumpkins, squashes of all kinds….. be creative. For cold food, just cut open at the top and scoop out the seeds and pumpkin goo (not sure if it has an official name) and you’re ready to use as a serving bowl. 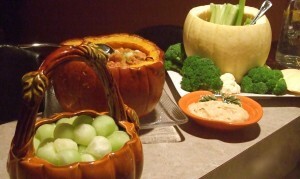 You can use one of those mini pumpkins scooped out for all kinds of dip, and I liked what H.P. member Linda did. She put her dip in a regular bowl, but filled a white pumpkin with all kinds of veggies for dipping and they looked so beautiful with all the different colors. If you are serving something hot, you might want to cook your pumpkin first. Cut open at the top, scoop out the seeds and pumpkin goo, rub insides with a bit of olive oil, salt and pepper, and place on a sheet pan or in baking pan. Bake for about 45 minutes or until done, in oven at 350 degrees. Let it sit for a bit, then pour in your soup, chili, etc. With the pumpkin cooked, when you scoop out some chili, you can get a bit of the cooked pumpkin with it and its really good! Posted in Cook Something Great, Entrees, Group Recipes, Soups | Stews | Comments Off on Put It In A Pumpkin! As most of you know, I was one of the many die-hard Trader Joe’s fans who wrote many letters to their corporate office, explaining that we needed a Trader Joe’s in our area. Thankfully, they listened! It’s a great place to find healthier food options at a better price than you’d expect. My favorite is their flash frozen fish – great to have in the freezer. And when you just can’t stand the idea of eating the same old thing for dinner one more time, click here for quick and easy recipes using the most popular Trader Joe’s products. Posted in Cook Something Great, Recipe websites | Comments Off on We Love Trader Joe’s! I ran into a great resource on Dr. Oz’s Real Age website. It is a very intricate recipe search for all the recipes on the site, and it includes filters such as gluten-free, sugar-free, etc. Very handy! To check it out, click here. These are a dream come true for those of us who don’t use sugar or sweeteners of any kind. I’m posting this recipe with many thanks to Elana Amsterdam and her wonderful new cookbook, The Gluten-Free Almond Cookbook (check out her fabulous blogsite, www.elanaspantry.com) I love the banana/blueberry combination but I’m already planning on experimenting to see what other variations I can come up with. Try experimenting and let me know what you come up with. Preheat the oven to 350°. Line 12 muffin cups with paper liners. In a large bowl, combine the almond flour, salt, and baking soda. In a medium bowl, whisk together the grapeseed oil and eggs. Stir the wet ingredients into the almond flour mixture until thoroughly combined. Stir the bananas into the batter, then fold in the blueberries. Spoon the batter into the prepared muffin cups. Bake for 35 – 40 minutes, until the muffin tops are golden brown and a toothpick inserted into the center of a muffin comes out clean. Let the muffins cool in the pan for 30 minutes, then serve.